The good news for the Kevin Kolb Era is that it would be difficult to get off to worse start than the Donovan McNabb Era did. This will be the first time in 10 years that the Philadelphia Eagles will enter a home opener without McNabb’s hands in another Eagle’s groin. Philadelphia opens the season at home against Green Bay at 4 p.m. on Sunday, Sept. 12. Newbie starter Kevin Kolb will lead the Eagles on Sunday, and after a sloppy preseason he has as much pressure on him as any quarterback in the NFL. 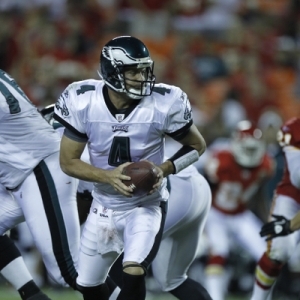 That Kolb is following in the footsteps of a legend, McNabb, has only heightened the drama. But by any measure McNabb’s “firsts” were a mess for Philly. They lost his first ever appearance at home in 1999, they lost his first home game as a starter in 2000, and they lost his first home season opener in 2001. The Eagles have gone just 5-5 straight up in season openers in the last decade. They were 5-4-1 against the NFL point spread in those contests. Philadelphia is also just 4-6 SU and 4-5-1 ATS in home openers over the decade, including a 1-3 SU and ATS slide over the last four years, all with McNabb at the helm. Kolb and the Eagles first team offense were a mess this preseason. They didn’t score a touchdown until the third game of the exhibition slate against lowly Kansas City. And that was the only one they managed. Kolb completed just 53 percent of his passes this August with one interception and no TD passes. The offensive line has been a disaster, but Eagles fans are among the most unforgiving in the league and McNabb has set the bar of expectations pretty high for Philly’s QB. There couldn’t be a team on the more opposite end of the scoring spectrum this preseason than Green Bay. They’ve made getting into the end zone easier than plugging fat chicks in Madison on a Saturday night. Packers quarterback Aaron Rodgers has gone 41-for-53 (77.4 percent) for 470 yards and six touchdowns so far this exhibition season. Green Bay has really made scoring look effortless, including a stunning 59-point effort in the third preseason game against Indianapolis. They were the third-highest scoring team in the league last year but have still seemed to find another level. It’s not all roses and cheese heads for Green Bay. They will be without two starters in the secondary (corner Al Harris and safety Atari Bigby) and I think that the Packers defense is set for a big letdown season after benefiting from an unreal number of turnovers last year. Philadelphia is having trouble protecting the quarterback. But if Kolb can get some time or make some plays out of the pocket I do think that the Eagles will be able to at least make it a shootout. This game has seen one of the largest line shifts in the league regarding the opening week lines. Philadelphia opened as a -1.0 favorite but they are presently a 3.0-point underdog at home against the high scoring Packers. The total has been pretty consistent at 47.5, which is the second-highest total on the board after the Minnesota-New Orleans Thursday night opener. ‘Under’ is 6-1 in the last 7 meetings. ‘Under’ is 4-1 in the last 5 meetings in Philadelphia. Packers are 2-7 ATS in their last 9 meetings. Packers are 1-4 ATS in their last 5 meetings in Philadelphia. Packers are 20-8-1 ATS in their last 29 road games. These appear to be two teams headed in opposite directions. Green Bay has put enough distance between itself and Brett Favre where this is clearly Rodgers’ team. And they are playing with the confidence of a group that knows it can do some damage and succeed in any situation. It’s still tough to bet against Andy Reid though. All the guy does is win. And no one ever made a million betting against Philly teams when they are home underdog. But those were the old Eagles. And right now this looks like a young team with a lot of unproven talent that is going to be dangerous to wager on or against all season. I think when the expectations on them get high they are going to fall on their face. But when they are low that’s when their playmakers can jump up and bite you. But not here. This one will be a shootout and will go down to the fourth quarter. I have to lean on the ‘over’ and the road chalk. I simply don’t see either team running the ball enough to keep the clock moving, and lots of passing is going to mean lots of big plays. In the end, Rodgers and the experience of the Packers will win out.